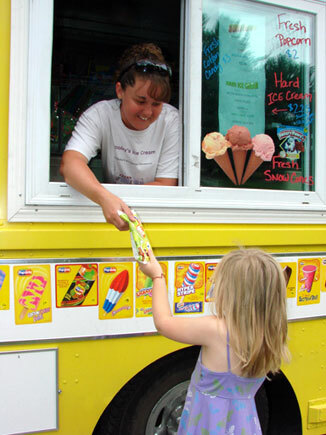 Cooley’s Ice Cream Truck has been serving the Warren County and Washington County area of Upstate New York since 2004. The independent and locally owned Cooley’s has been a staple at community functions, holiday celebrations and the side streets of the area. Known by the unmistakable bright yellow truck, Cooley’s carries more than just ice cream novelties, and buys all products fresh and locally. New for 2017, Cooley’s is offering a soft serve concession trailer. The trailer will offer your traditional soft serve cones, sundaes, frappes, milkshakes and fresh snow cones. This trailer is perfect for street events, festivals, large family gathers, and corporate events. Cooley’s Ice Cream Truck is the perfect treat at family reunions, birthday parties, corporate events, city and town celebrations, holiday events and any other private function where you need smiles and treats. Cooley’s also offers parents the opportunity to set up an account and pre-pay for ice cream in case they may be short on cash, or their kids are on bikes around the corner. Many families take advantage of this option, you can bet the kids like the idea. Any questions regarding private parties or setting up an account, just Contact Us.